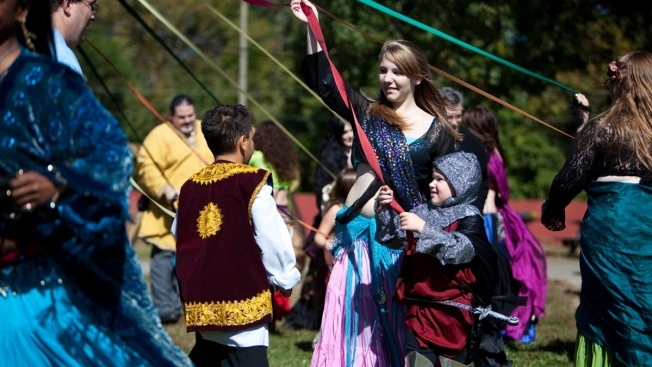 Virginia Renaissance Faire: Last Chance This Weekend! The renaissance is almost over! The Virginia Renaissance Faire is wrapping up this weekend, June 6-7. You have just a couple more days to visit Lake Anna Winery (5621 Courthouse Road, Spotsylvania, Virginia), as Queen Elizabeth makes her visit to the village of Staffordshire. Dancers, musicians and jugglers will welcome the queen and seek her favor. Learn the art of jousting as knights on horseback show the process of getting into armor -- and into battle. Skilled archers offer lessons on the long bow to make hunting your dinner a sport. A family circus incorporating four performance puppies can offer both cuteness and daring. Musicians infuse Celtic tunes with comedic lyrics to create the village atmosphere and to transport participants to that Shakespearean time. Performance groups take the Bard's classics and give them a unique spin by turning tragedies into comedies and giving his works a modern perspective. You'll also discover plenty of food -- think fish and chips, Mediterranean foods, cinnamon-roasted nuts and more -- as well as plenty of beer and wine. Vendors will offer scores of shopping opportunities, including jewelry, pottery, swords, candles, leather goods and more. Kids will find various activities including puppetry, arts and crafts and a greeting from Queen Elizabeth. The Faire runs 10 a.m. to 5 p.m. both Saturday and Sunday. General admission is $10 per person; kids age five and younger get in free. Pets are not allowed.